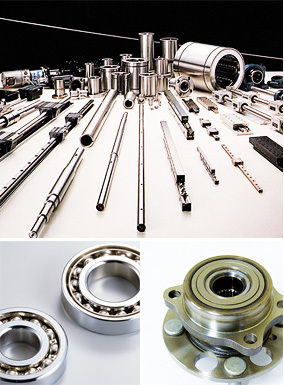 Sanyo Special Steel takes advantage of the high-cleanliness steel production technology in achieving the world’s top cleanliness and leads the bearing steel industry because of its high quality and reliability. We have also established a system to produce and offer steel bars, wire rods, tubes and formed and fabricated materials that match the process of each customer in terms of shape. High hardness is achieved by direct quenching, while machinability is improved by spheroidizing annealing. The carburizing process provides a tough core as well as a surface featuring hardness and wear resistance equivalent to those of high-carbon chromium bearing steel. The material, featuring high wear resistance, corrosion resistance and heat resistance, is used to make bearings mounted in an oxidizing atmosphere or high temperature, where corrosion of material is accelerated. Induction hardening is applied to portions where high hardness is needed.